Barbara Cubin is an American politician. 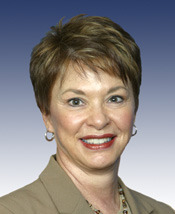 She has been a Republican member of the United States House of Representatives since 1994, the sole member of that body from Wyoming. Cubin was born in Salinas, California. She was educated at Creighton University, and began her political career in 1986, when she was elected to the Wyoming House of Representatives (1986-1992). She spent two years (1992-1994) in the Wyoming Senate before running for Congress to succeed Craig Thomas, who made a successful run for the United States Senate. Cubin's first race was very close by Wyoming standards (Wyoming is one of the most Republican states in the nation), with Cubin only winning by seven points. Since then, she has won by wider margins. Cubin's voting record is conservative. A staunch opponent of abortion in any form, Cubin has consistently voted for restrictions on abortion and against funding of family planning groups that provide abortion services, counseling or advocacy. Her strong pro-life record may hurt her reelection chances, however. Despite being a Republican stronghold, a majority of Wyoming residents consider themselves pro-choice (Survey USA, 2005). According to the Center for Public Integrity, Cubin's largest campaign contributors include the tobacco industry, livestock companies, and extractive industries (including oil, gas, and mining companies). In her initial campaign for Congress in 1994, Cubin pledged that she would not serve more than six terms. However, she is running for re-election in 2006, for a seventh term to begin in January 2007. On May 8, 2006, the Rasmussen Reports polling firm reported that Cubin was ahead of Democratic candidate Gary Trauner by four percentage points, 47% to 43%. In mid-August, CQPolitics changed their rating of this race from "Republican Favored" to the more competitive "Leans Republican." They wrote, "Despite a usually dominant Republican edge in conservative Wyoming, Cubin personally is not overwhelmingly popular: She took 55 percent of the vote in 2004, which was her lowest vote share since 1996 and 14 percentage points behind Bush. With popular Gov. Dave Freudenthal at the top of their ticket, Democrats are hoping for an upset by small business owner Gary Trauner. He trailed the incumbent in overall fundraising as of June 30 but actually had slightly more cash on hand." On July 23, 2006 the Star-Tribune reported Cubin "will keep the money she received from former Rep. Tom DeLay's fundraising committee even though the organization has been fined for campaign finance violations and is shutting down." DeLay's Americans for a Republican Majority was agreed to pay a fine to the Federal Election Commission for "misstatements of financial activity, failure to report debts and obligations and failure to properly allocate expenses between federal and non-federal accounts," and is closing. The Wyoming Democratic Party has repeatedly called for Cubin to return the $22,520 she has received from DeLay's committee. The Party noted, "It's clear that Barbara Cubin will do anything and everything to raise money, but the great irony is more and more people in Wyoming are seeing her transparent efforts and that's why she's forced continually to turn to out-of-state PACs for contributions." On April 7, 2003, Cubin made infamously insensitive remarks on the House floor, observing: "One amendment today said we could not sell guns to anybody under drug treatment. So does that mean if you go into a black community, you cannot sell a gun to any black person?"